Livestock grazing along a watercourse can lead to direct pollution of water with urine and faeces which could mean pathogens entering the water. This can destroy aquatic habitats and lower the quality of water that could potentially enter the water that humans use. Excluding bovines from watercourses will prevent the breakdown of vegetation on the banks of the watercourse. It will also prevent pollution of the watercourse from bovines. The GLAS scheme encourages farmers to fence off watercourses to keep animals from polluting the water. There are many requirement to abide by to be approved for the payment of €1.50/meter/year. Participants with an owned bovine enterprise must fence off all watercourse(s) on GLAS contract lands a minimum of 1.5 metres from the top of the bank of the watercourse to exclude the bovines by 31st July 2016. The fencing must be stock proof, fit for purpose and be undertaken with permanent stakes and wire. However, fencing off these watercourses can cause another problem for farmers. If the animals cannot access the water from the river, farmers will have to get a water connection supplied to that area of land which can be very expensive. 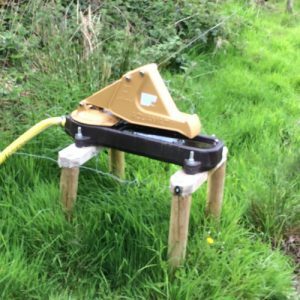 We have another solution to providing water to animals while also following the GLAS requirements. 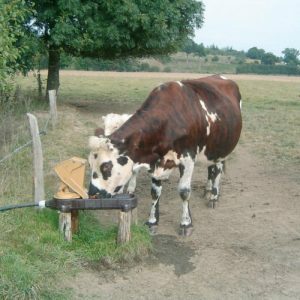 A pasture pump. The Aquamat is reliable and sturdy. Its push rod surrounds the mechanism to avoid accidents. It is made from polyethylene and cast-iron. It is easily pushed by animals and is suitable for up to 10-15 animals. It is also available with a side bowl option for calves. The Aquamat has a non-return valve feature to prevent the pump from running dry.